Light, Bright & Spacious Open-Plan Apartment Has Surprisingly Large Balcony (Gas BBQ Outlet) With Fabulous S.E. 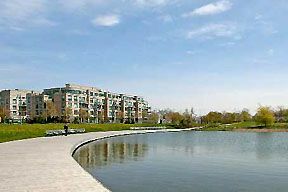 View Of Lake & N.E. View Of Beach Landmarks. Walls Just Completely Designer Re-Decorated, Including Beautiful Mosaic-Tile Backsplash In The Granite-Countered Kitchen. Lots Of Kitchen Cabinets Plus A Deep Breakfast Bar. This Perfect Home-For-One-Or-Two Even Has A Bathroom Whirlpool Tub! Very Friendly Residents In One Of Beach’s Best Buildings. 1 bedroom, 1 bathroom, with 1 parking space and 1 locker.